Transform Rockford, the Rockford Area Convention & Visitors Bureau and the City of Rockford have taken on social media’s hottest trend, the #10YearChallenge. The challenge provides an opportunity to showcase side-by-side photos comparing what the city looked like ten years ago versus what it looks like today. Below are a few highlights of how the city, and its infrastructure, have changed over the last ten years. o 10 years ago – The dilapidated Ingersoll Factory sat vacant along the banks of the Rock River. o 2019 – The old factory was converted into the UW Health Sports Factory, making it one of the largest sports facilities in the Midwest. Operated by the Rockford Park District, it is 108,000 square feet and features up to eight basketball courts, 16 volleyball courts, an outdoor river walking path, full-service sports bar, meeting space, concessions and more. The building symbolizes the history of its original site and the shell of the former factory still remains in place today. o 10 years ago – The Morgan Street Bridge was deteriorating quickly, threatening east-west traffic flow on the south side of Rockford. o 2019 – The new intricate white tied-arch bridge features interchangeable lighting, a bike path and pedestrian overlooks. o 10 years ago – The Main Street mall in downtown Rockford was currently being torn-up to become a two-way street. o 2019 –North and South Main Streets are now two-way streets, end-to-end. The street now offers café-style seating on sidewalks, on-street parking and “Gateway” streetlights and arches. o 10 years ago – Several downtown buildings were vacant and aesthetically dated. o 2019 – Every storefront in downtown is occupied. Several buildings received makeovers and now the streets are lined with everything from luxury lofts to hair salons, coffee shops, high-end restaurants & bars to specialty stores selling anything from t-shirts, home décor, skateboards, fine chocolates, antiques and more. o 10 years ago – Auburn Street and North Main Street was a neglected intersection that was in desperate need of repair in order to attract new businesses and private investments. o 2019 – A new roundabout took over the intersections with approximately 26,375 cars passing through the roundabout each day, according to traffic counts from the Illinois Department of Transportation. The Auburn Street/North Main Street corridor has attracted new businesses and has reduced automobile accidents. 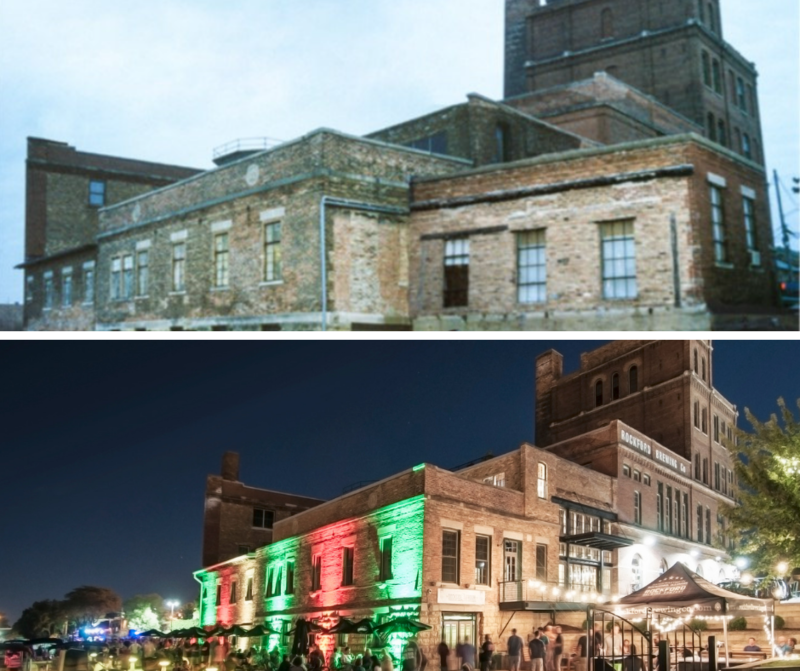 o 10 years ago – The 76,000-square-foot former brewery and warehouse sat vacant along the banks of the Rock River. o 2019 – Prairie Street Brewhouse is a fully restored and historic five-story building that boasts a restaurant, two tap rooms, event spaces, outdoor patio, ten luxury loft apartments and a handful of boat slips on the Rock River. The restaurant brews its own beer and is known for its Thursday night “Dinner on the Docks” event during the summer months. o 10 years ago – The Amerock Building was purchased by the city of Rockford for $240,000. It recently became vacant after being the a site of major knitting and cabinet hardware industries. o 2019 – The Amerock Building is undergoing a massive transformation to become the Embassy Suites Hotel & Rockford Conference Center. The 160-suite hotel is scheduled to open in 2020.
o 10 Years Ago – Rockford City Market debuted featuring street vendors, musicians, food and children’s activities along Water Street in downtown Rockford. o 2019 – Rockford City Market is still going strong, however it is now housed under a new pavilion. In the 2018 season there was a total of 78 vendors and more than 99,775 visitors attended the market. o 10 Years Ago – Aging commercial strip malls and former Box’s Bar-BQ could be seen along Marchesano Drive. o 2019 – Rockford Fire Station #3 and the new SwedishAmerican Riverwest Clinic have given new life to a once abandon corridor on the city’s southwest side.